Brendan recently appeared on the Irish version of Dragon's Den and secured an investment of €80,000 from two of the dragons - that's how impressed they were with the products. Would I be similarly impressed? The product is a spray formulation - like a fine mist - that's applied with a soft velour mitt. I tested the darker shade but there is a lighter one too. You need to work fast as it does dry within 10 seconds but the mist has a colour so you can see where you've applied it. Accuracy is key - I was a bit sloppy the first time I used it and ended up with a white gap on the back of my leg. But the second time, I took my time to ensure every inch was covered. As well as getting a nice light colour to the skin when you put it on first, the tan deepens after a few hours and the 10 second drying means you can dress straight away. Both times I used it, I put skinny jeans on after a short time and the tan developed perfectly with no marks from the jeans. The verdict? I'm impressed. I layered it up the first time and the finish was exactly how I'd be after a salon spray tan. Deep and dark - perfect for a concert or a formal event. The colour stayed even and with minimal fading for 4 full days, after which I removed it in the shower with my favourite tan removal mitt...brilliant for these kinds of tans. The second time I put it on, I got a lighter outcome, which is more what I'd want for day to day. But it is the staying power I'm most impressed with. Even 4 or 5 days on, the tan is visible and I don't feel any need to top up. It's not fading that much and is still lovely and even. I'm pretty good at putting tan on and apply fake tan year-round. I think the more expert you are at tanning, the more impressed you'll be - though having said that, practice makes perfect! The spray formulation (as opposed to a cream formulation) does dry the skin out so I put on lots of Aveeno lotion each evening before bed, which I think has helped the tan hold well. I didn't test it on my face as I prefer to use a face-specific tan there. I'm super fussy with tans and wouldn't endorse many but this one is definitely going to be my go-to body tan for this summer. I've tried others that have given a comparable tan but nothing that's got the lasting effect and the clean wear-off I'm getting with this one. Oh and there's no smell from it - genuinely. Not even a particularly watermelon-y fragrance...just lovely and neutral. Before I finish, I just wanted to give Brendan's brow product a mention too. I've used a number of different brow items over the years and for me, I always come back to a powder as I think it gives the most effective and least 'fake' looking finish. 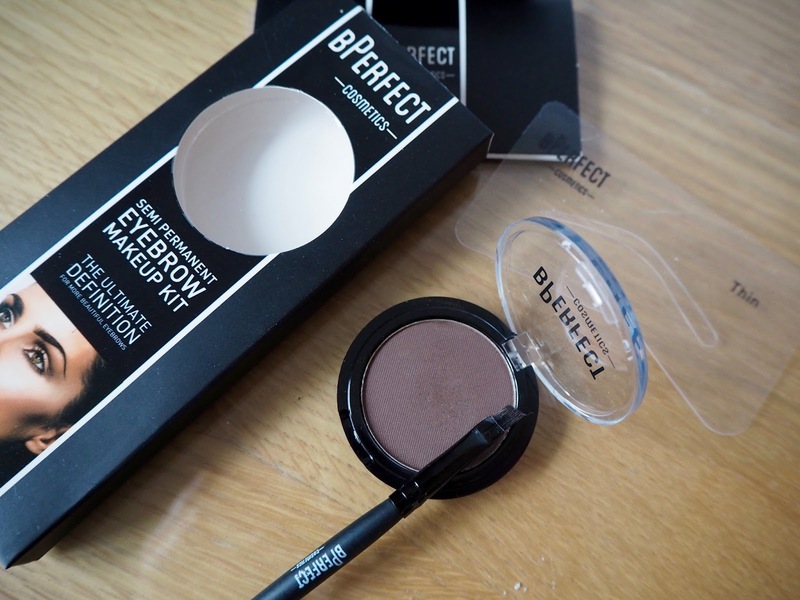 What set the BPerfect product apart for me is the brush - it's fantastic and makes it easy to apply the powder in a subtle way, which is what I want. Now you can use it to give yourself full-on HD brows too (and it comes with some nifty stencils to help with this) but I just want a subtle filler for those few weeks when I know I need a tint but I can't find the time to get down to my brow queen, Lynne! Both products are available on the BPerfect website here and in local pharmacies - stockists on this link. PS - if you were expecting white leg/brown leg photos...I'm sorry I've not delivered. I'm leaving that to the models & young things on Brendan's website! Disclaimer - I was provided with product to test but wasn't paid to write this blog post nor was I obliged to. I'd never endorse anything I'm not 100% happy with. If it doesn't pass the grade, it doesn't appear on here. Really must try this!! The colour looks fab. Out of interest what tan do you use on your face? Hi Kathryn, sorry a bit slow replying. I have found white to brown cream tan gives me least breakouts. The vita liberata night mask is the most gentle I've used but the colour is slow to build whereas the W2B is an instant colour so is great in the morning when you realise you're as pasty as.